iconic guitar.com: Jerry Garcia - "Tiger"
Jerry played dozens of guitars throughout his career, but in 1979, Doug Irwin created "Tiger" which Garcia played for 11 years. It was his most played guitar and played it at his last concert. The Tiger's body core is made of curly western maple, and is laminated with 3/16" vermilion and 1 /28" maple. The top and back are made of book-matched, carefully selected coca-bola, which was chosen for its grain pattern, integral knots, and red color. Irwin mixed exquisitely detailed, intricate brass work with dense, exotic hardwoods in his designs. 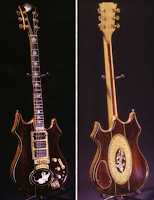 He also incorporated a lot of special features Garcia himself devised, like a loop that ran the signal back through the guitar so he could control his special effects with knobs on the body of the guitar or a built-in pre-amp hidden beneath Irwin's inlays. Electronically, "Tiger" had a Strat approach, but with one DiMarzio SDS-1 single coil and two DiMarzio Super 2 humbuckers that were easily removed because Jerry thought their output weakened after a year or two. Labels: Doug Irwin Custom, Jerry Garcia - "Tiger"